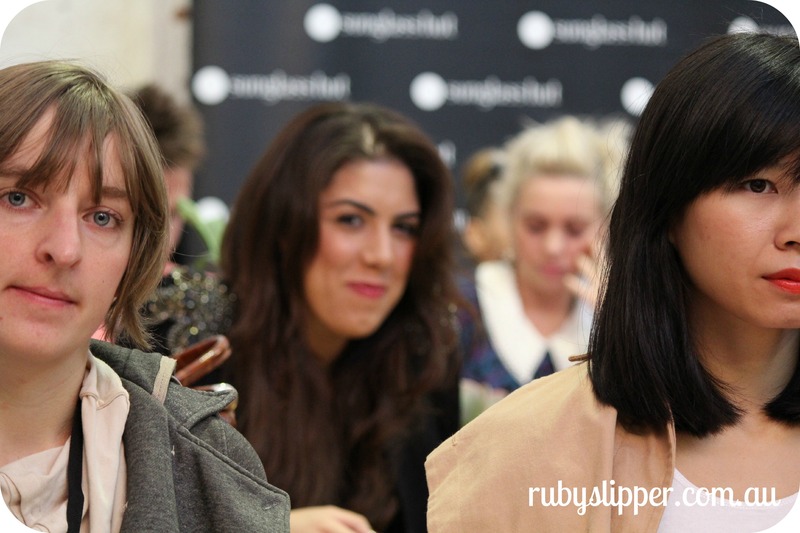 Fashionopolis was an opportunity for bloggers who only know one-another ‘online’ to connect and hobnob in the flesh. Ooh! 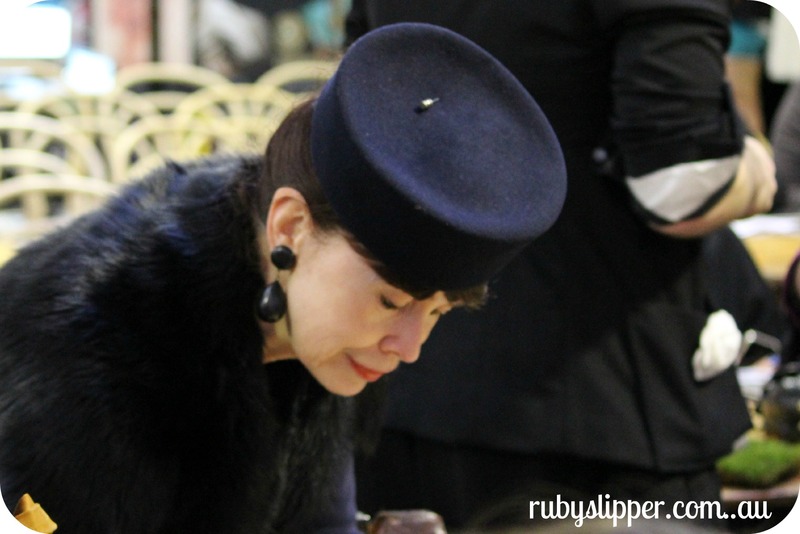 Check out this natty chapeau! 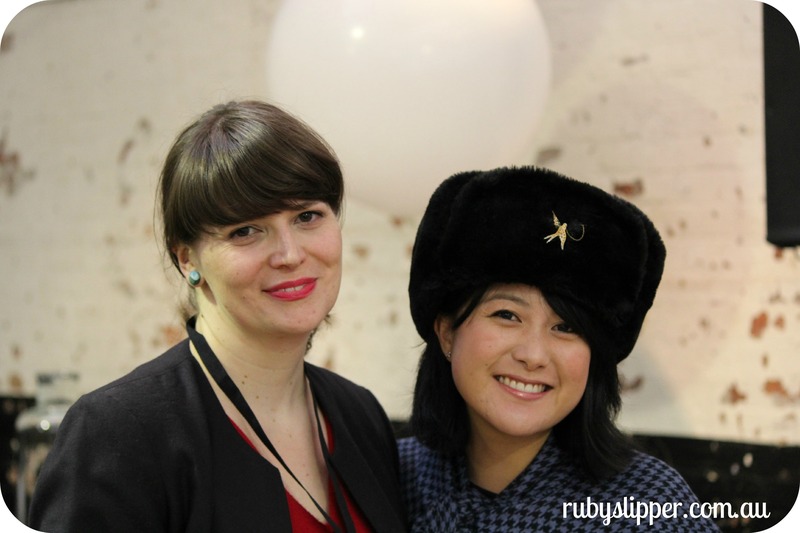 ….and more hats again! Writer of note Lou Pardiand Cheryl from Business Chic in a ra-ra-Rasputin number. It was a cold day in old Melbourne town. Not just for girls! Fashion bloggers Yahav Ron from Paris ’99 and Calvin of Vanity Press. Fresh! 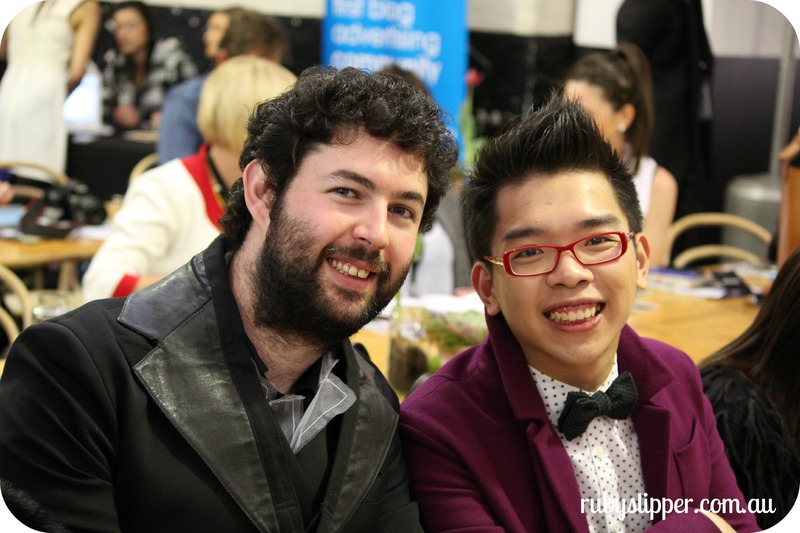 The Fashionopolis event was opened by David Krupp of Nuffnang Australia and Phoebe from Lady Melbourne. 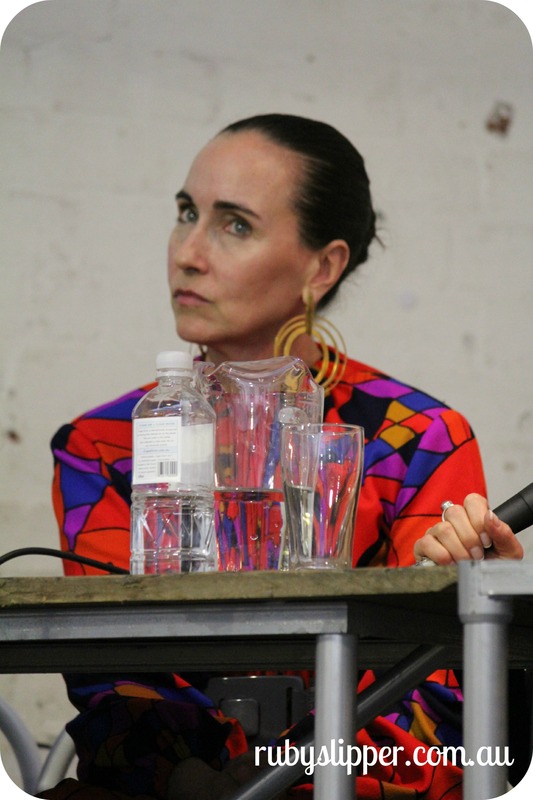 To come were three sessions of discussion – the first from Phoebe on the development and daily machination of running a commercial blog, the second a Fashion Torque panel and the third a discussion on monetization of content. Just looking casual and striking a Dynasty pose. When there’s long staircases and bloggers ….. there’s drama. Phoebe is a fashion blogger and so much more. 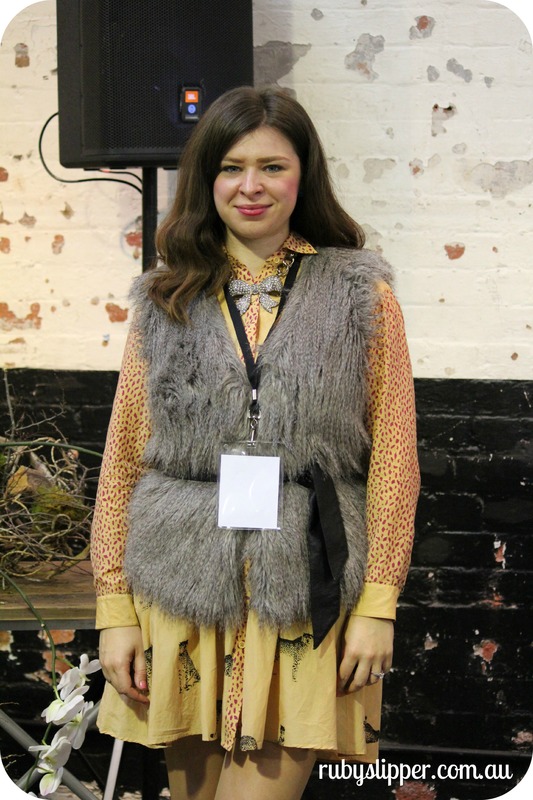 With two degrees under her belt, international experience and killer fashion chops built-in, Phoebe is in many ways a poster girl for Australia fashion blogging at its peak. Cosied up on a bed surrounded by blooms from Domain Flowers, Phoebe spoke at length on the journey of her blog. A point made repeatedly throughout the day is that there is no singular way to approach blogging (for profit, or for pleasure). Certain trends are on the up – imagery being the new ‘currency’ and photographic quality becoming increasingly important – but Phoebe made clear that diversifying your content in a range of ‘shareable’ forums is a way to enhance the saturation of your content. Facebook, Twitter, Blog, Pinterest, and Tumblr are all ways to share your content in different ways to your audience. Phoebe also covered over basics – professionalise your blog as far as you are able to with the resources you have. Spellcheck your content, invest in a tripod so you have greater editorial control over your images. Don’t discount yourself if you don’t have the newest tech – the Sartorialist started off with really lo-fi quality before building to the powerhouse blog it is now. Phoebe also encouraged bloggers to ‘know’ their voice and be consistent. Don’t be profane and bitchy online (unless that’s your schtick) – and be careful and mindful of all content you pop up on your Facebook. Re-think any drunken staggering images! A blogger’s identity is part of their work – so protect and respect it. Blog Factoid – Did you know 32% of consumers are more likely to purchase from a brand they have connected with on social media? Phoebe also spoke about allowing your readers to experience work you enjoy in the blogosphere by creating a ‘blogroll’. Promoting bloggers you admire can be a great way of expanding your own audience using regular commentary. She also spoke on blogs as needing to be more than a regurgitated press release. Instead of using the official imagery provided by the media, try and create your own take on the content in writing and photography. Make it interesting for your readership. Phoebe also spoke about the many ‘unmentioned rules’ of accepting gifts or invitations. There are no ‘free lunches’ in blogging – so make sure that you feel comfortable in promoting content you accept appropriately. There was also a final note of caution to be careful with your writing – acknowledge when you are creating ‘advertorial’ when appropriate and be vigilant to make content which is not libelous. Cecylia and Dasha with matching gold band collars. Great minds trend alike! Michelle of Michelle’s Style File fame looking beautiful! 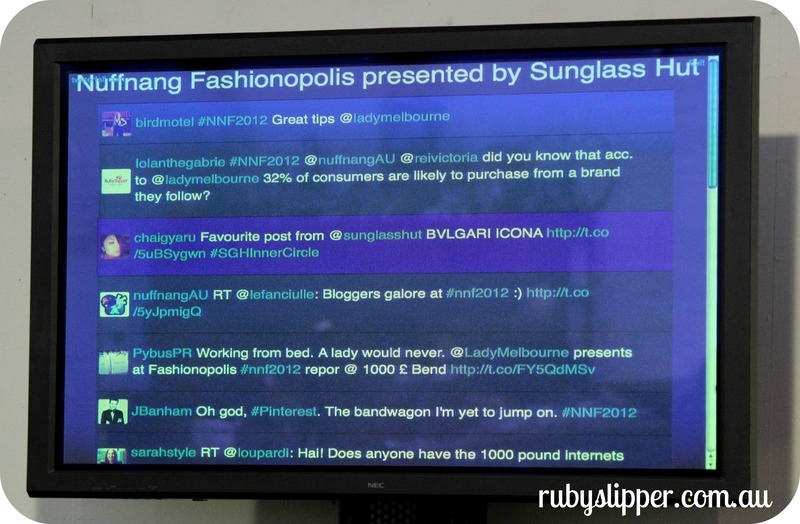 Throughout the day live Twitter feed screens allowed bloggers to match ‘real world’ and ‘online buddies’ neatly together. We use Twitter regularly in our networking for Ruby Assembly and on behalf of our clients, but have a sneaking suspicion it’s doing something not-so-flash for the brains and concentration of Tweeters. What short attention span? In some ways this is my favourite photo from the day. Not only are all the subjects beautiful and focussed in their own individual ways – this image highlights the breadth of different identities in the blogging community. When it all got a bit too much for a gal to take, there was a Fashionopolis bed to snuggle into for Tempe and Kyra of Pybus PR. Vintage vixens Ayr Lox’ide and Esme and the Laneway – different shades of vintage in a creamy-cheeked palette. Tish-tastic! 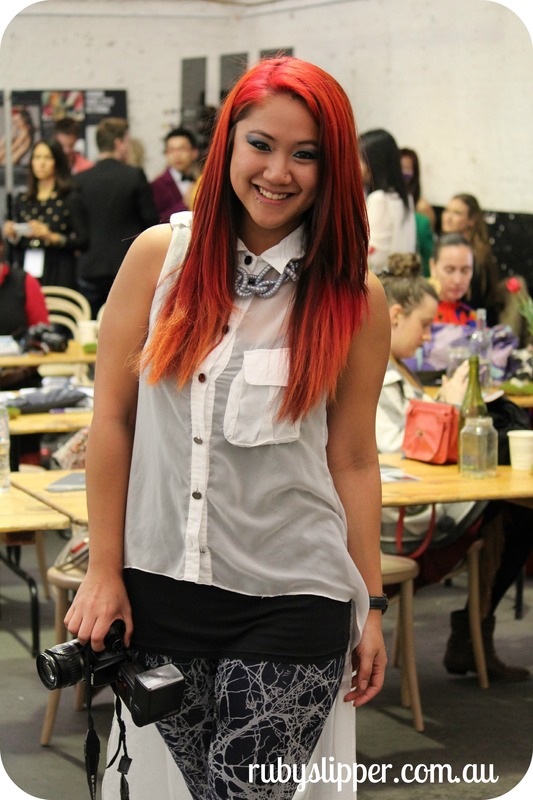 The lass behind Mister Mode, Tish Tambaku – rocking a seriously glowing red-dye ‘do. The second session of the day was held after a banquet of tasty baguettes and coffee courtesy Thousand Pound Bend. 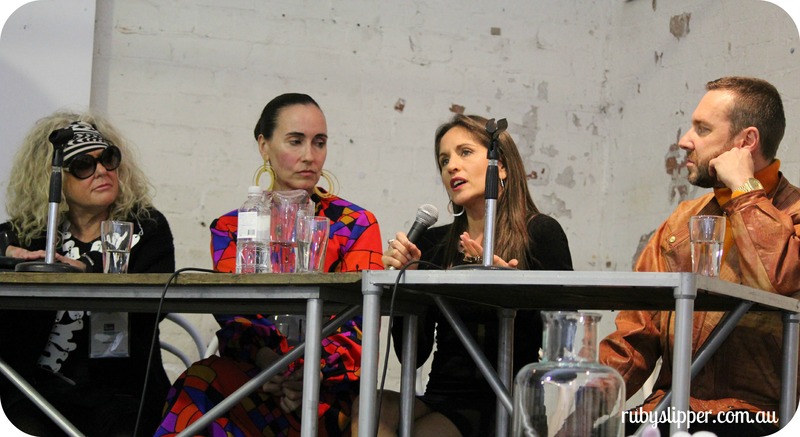 A special edition of Fashion Torque, this session was a forum panel consisting of Jenny Bannister, Philip Boon, Patty Huntington of Frockwriter and Sarah Gale from The Iconic. The Fashion Torque panel session was generalist in content, and a great intro to those who haven’t participated in a Fashion Torque session previously. The highlight for me was the contribution of Patty Huntington who impressed me mightily. A ‘self taught’ journalist who began her career on a Parisian morning radio show, Patty returned to Australia with several designer interviews which she onsold to newspapers. Patty is proof that doing an RMIT journalism career isn’t the ‘be all and end all of’ creating a successful commercial writing career! Patty does have a tertiary degree however – french/fine arts/english – which provided her solid research/writing and analysis grounding. She looked amazing too, like some kind of Modigliani-draped espagnola. I will stop my gushing now, but I did find Patty really admirable (in the same category as Annabel Crabb for me – but in the fashion vein). Patty spoke about the mobility of blogs – even the smallest niche blog can gain momentum quickly by being picked up by larger blogs or commercial media. She did note that bloggers are insular – in that they are their own editors, sub-editors, photographers, marketers etc. Unlike working on the floor of a traditional newsroom where mentoring and education may occur, blogging on your ownsome and learning through trial and error can result in growth at a slow pace. Patty also spoke about the prevalence of ‘contra payment’ in both the blogging and modelling worlds. Being paid in discounts or old-season stock doesn’t make a creative existence as a blogger possible. Always be cautious when approached by large brands who are happy to have you work for them, but have ‘no budget’ for your inclusion. There are two words for this – FINANCIAL ABUSE! Patty considering her response to a question from the floor at Fashionopolis. Sarah Gale spoke about the blog as a feminine voice, as opposed to the more masculine contribution made by traditional print media. Sarah is one of the drivers behind The Iconic, an online shopping hub where you can purchase on-trend fashion. Sarah says that The Iconic’s customers are highly influenced by the style and recommendation of bloggers. 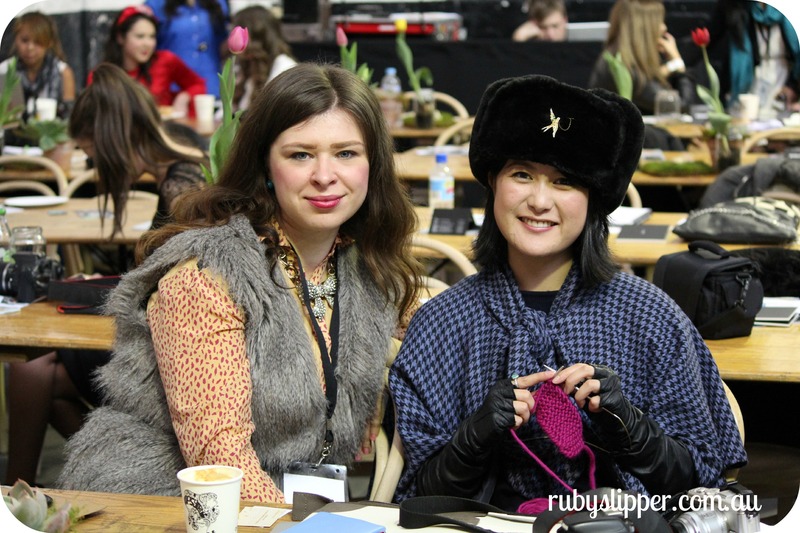 In between sessions was a great opportunity to catch up with Cheryl from Business Chic who is the ultimate multi-tasker – knitting, chatting and participating in an industry forum. Triple threat! 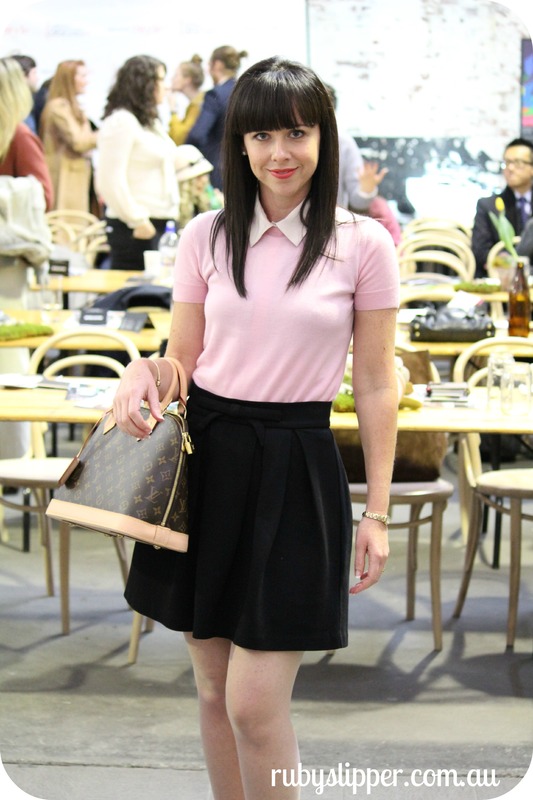 Suzi Maynard of For The Love of Audrey channels ladylike chic with LV bag and polished bangs. A clever take on hardware – this dapper gent in Burberry Prorsum jumper looks a true knight in shining armour. Man-glam. The last session of the day on the topic of monetizing blogs was juiciest of them all. Like a fashion-meets-economics version of Q&A, but with fewer members of the Young Liberal movement (maybe). 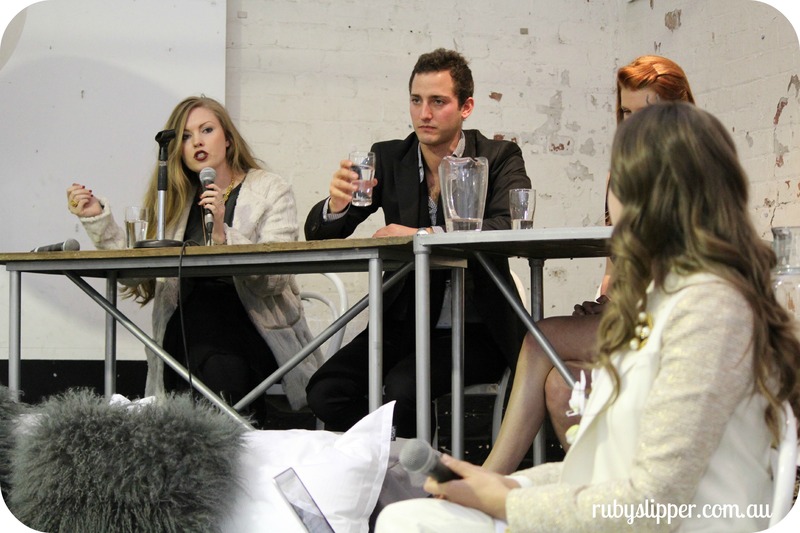 The panel consisted of Kyra Pybus from Pybus PR who regularly collaborates with bloggers, head of Nuffnang Australia David Krupp, Amber Venz from Venzedits and Phoebe from Lady Melbourne. Many people are curious as to how it is possible to make a living from blogging. As Phoebe said, she’s regularly quizzed on the kind of money she brings in from her Lady Melbourne identity. Like Susie Bubble before her, Phoebe comments that the income of a professional blogger doesn’t come solely from one source. It’s not simply banner ads or ad campaigns (like those provided/offered by the Nuffnang group) that make up the income of a successful blogger – it’s also private negotiations with brands in addition to collaborations with other publications that contribute. The panellists each came with different ideas on the monetization of blogs. Nuffnang and Venzedits are effectively services which place adverts on your blog which may bring you (in most cases nominal) income on a monthly basis. Venzedits is a new kind of recommendation/referral service where you can bring in revenue from ‘recommending’ certain brands or products using their affiliate programme. Nuffnang and Venzedits are different services and companies – but they’re effectively brokers between the blogger and the brand. For bloggers who consider themselves hobbyists or those who enjoy sizable monthly traffic (15,000 hits or more per month), Nuffnang et al. can provide some benefits ( a sense of legitimization by having ‘quality brand’ banner adverts on your page, or income for those rare bloggers who have a prolific identity). At Ruby Assembly, we feel that banner ads aren’t appropriate at this stage for our readership. The small amount of potential income from a Nuffnang-style affiliation doesn’t outweigh the negative of having advertising on our page which we haven’t explicit control over. Moreover, the quality of our blog content shouldn’t be so easily utilised by an intermediary marketing company for so little. This isn’t to say that such advertising arrangements aren’t useful for some blogs – they’re just not a good fit for Ruby Assembly at this stage of our development. We much prefer to choose our marketing partners, and negotiate privately with them on any promotional arrangements. There is an argument that if negotiation simply isn’t your forte, you should simply allow intermediaries such as Nuffnang to negotiate on your behalf with advertising partners. In my business experience, negotiation is an essential skill and any author who values their creative output must learn to negotiate robustly as soon as possible. Whilst content continues to be provided for free or co-opted for next to nix, creatives will continue to remain poorly paid. Be the change you wish to see and never sell your skills or content short! 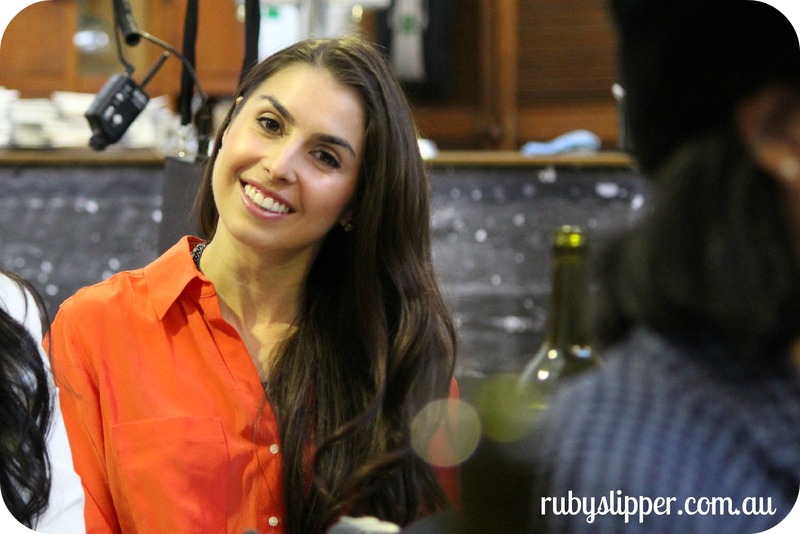 As Phoebe highlighted – make sure to tell your potential marketing partners about your skills. Do you have multiple degrees or overseas experience? Are you a specialist author, stylist, makeup artist, photographer or poet? Make sure you build value into your proposition, and let your marketing partners feel confidence in your expertise and capacity to communicate the benefits of their brand. This discussion made me think more about Susie Bubble’s comments on the value and influence of blogs – and how they are measured by marketing companies and PRs. You can read more about Susie on the Ruby Assembly blog by clicking here. It’s not useful to consider a blog’s success and influence purely by hits. What if a blog gets 20,000 hits a month and has a median age read of 19 years old and a median reader income of $35,000 per annum? How does such a blog measure up on the influence stakes against a blog which enjoys a quarter of that readership but has a readership with a median age of 35 and a median readership income of $100,000? Which blog is more likely to influence real-world marketing outcomes for a brand? It’s critical at this juncture that intermediaries such as PRs and marketing agencies look closer at the demographics who access various blogs, and look to match brand partners with appreciative audiences – and not simply fixate on the raw tracking numbers provided because they’re easy to explain to brands. 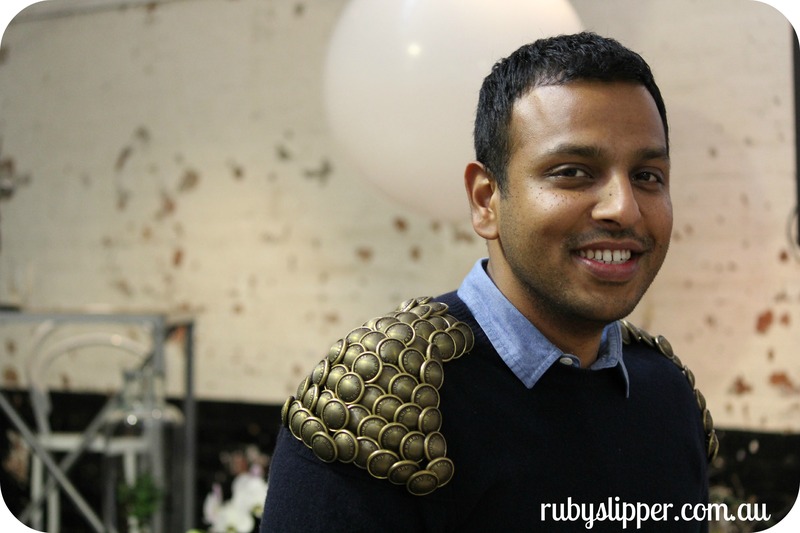 At Ruby Assembly we say don’t hand your creative power over to ‘the man’ – learn to negotiate and enhance your value by negotiating any monetization projects by yourself. Banner adverts won’t pay your rent and get you writing full-time, but on-going creative partnerships with brands who admire your style and respect your readership certainly will. God knows I never had so much fun working in any corporate environment under the scythe of the KPI. 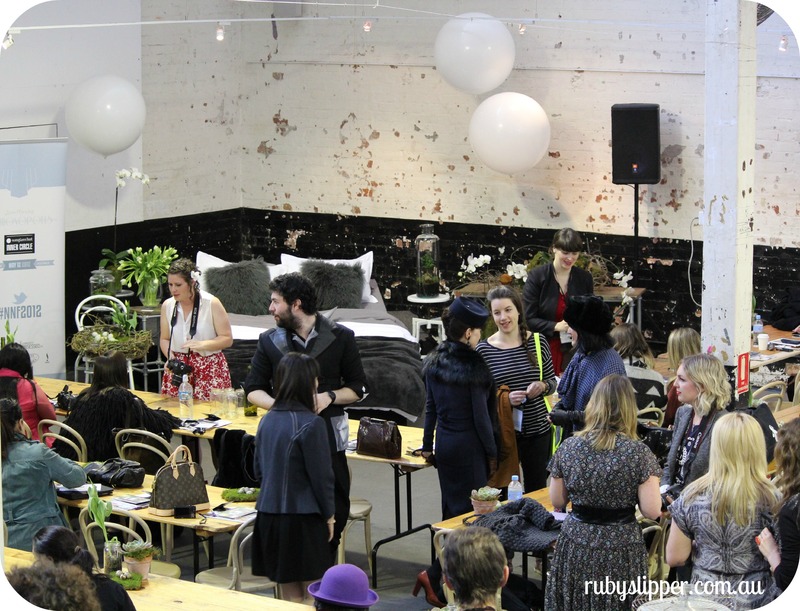 Here I am being profesh in a giant bed with bestie Kyra and Tempe from Pybus PR at Fashionopolis. This is the creative life that is worth learning to negotiate for, and don’t let anyone ever tell you otherwise! Thanks to Lady Melbourne for getting a bee in her bonnet about organising a forum such as this which has brought up a range of exciting discussion and debate. 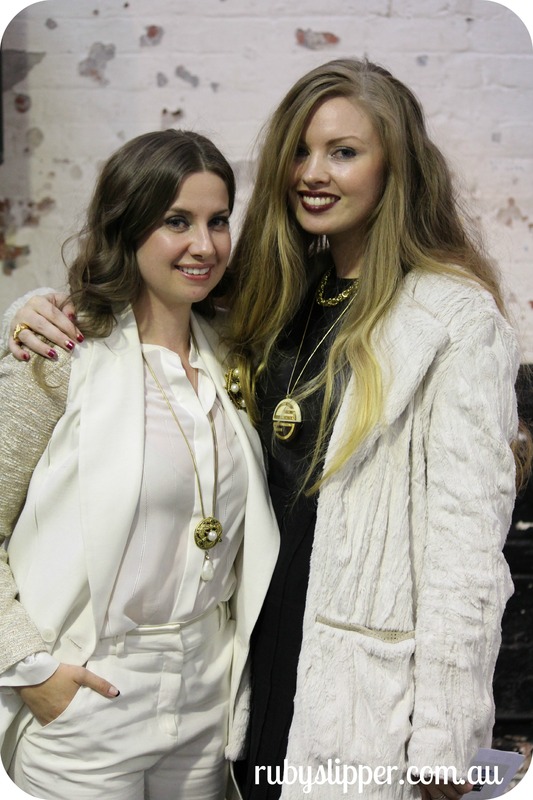 May this be an annual event for Australia’s fashion and lifestyle category bloggers. Fantastic review and analysis as well as opinion piece Ruby Assembly. So many generalist bloggers could learn from this blog. Congrats to all bloggers who participated. Wonderful post! “Just looking casual and striking a Dynasty pose. 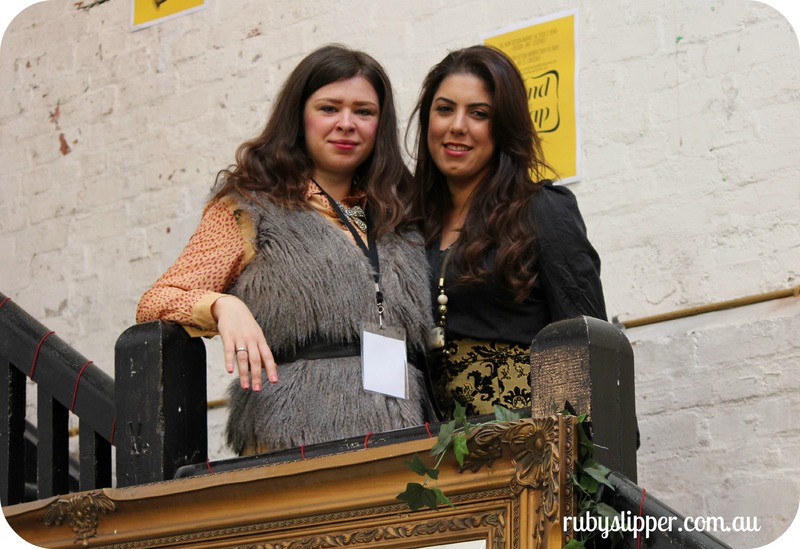 When there’s long staircases and bloggers ….. there’s drama” So true! We love that picture.